We guarantee our platform beds, made by us, for as long as you own them. Try finding that at any other store. 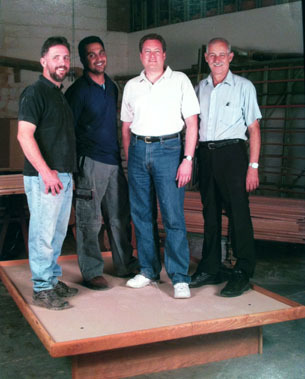 Bedworks' woodworkers build our solid platform beds in our own woodshop. We offer them in 2 different species of hardwoods: Black Cherry [Prunus serotina] and Bubinga [Guibourtia demeusei]. You'll find a lot of our Bedworks' staff sleeps on our platform beds and sofa beds. So, we won't sleep well unless you sleep well. Come vist our Cambridge showroom and woodshop to try out our lifetime warranty platform beds. Thirty years ago in the United States, only Bedworks, New Moon and Shinera made and sold futons and futon frames. Now dozens of mattress companies make futon mattresses, while American, European and Indonesian woodworkers build futon frames. The futon sofa bed's world-wide popularity allows us to provide much greater quality and comfort than ever before! We select the most comfortable futons and the strongest futon frames - from unfinished to the most luxurious and every style in between - to bring you great value and comfort at fair prices. Our 40 years of handcrafting experience is what makes Bedworks unique. We're a master furniture maker that ensures our customers take home great beds at reasonable prices -- even if we don't make them ourselves. We always insist the beds we offer meet your expectations for comfort, quality and value. Visit our Central Square Workshop/Showroom. Browse through our broad selection. Ask lots of questions. We'll give you straight answers. You'll find the right solution for you. Guaranteed. "Have had a floating platform bed since 1980. Survived through siblings, dogs & moving. Now own a double & queen. Long lasting and solidly built."